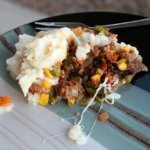 While Shepherd’s Pie probably doesn’t come to mind when you’re thinking about campfire food, this recipe will make your life easy at the campsite, since there is virtually no prep work outside of your home kitchen. All you’ll need is a bed of coals and about thirty minutes to cook it. 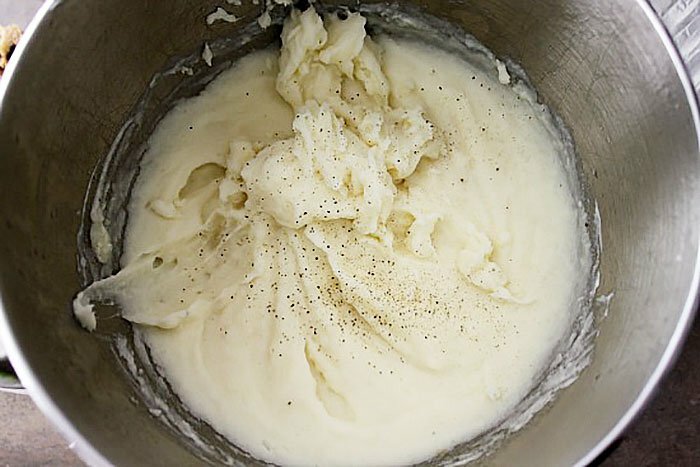 If you would prefer to make your own mashed potatoes, substitute the following for the instant mashed potatoes. Almost every step of this recipe can be done at home before you head out to the campsite. In your home prep, you can basically boil things down to two parts. Making the potatoes and making the meat filling. 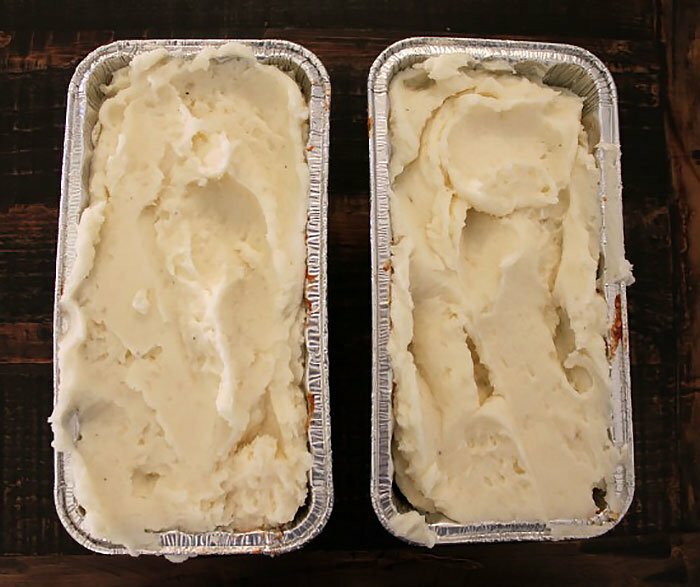 If you’re opting to go with instant mashed potatoes, then just follow the instructions on the box. Use enough to make about five servings. Simple enough. 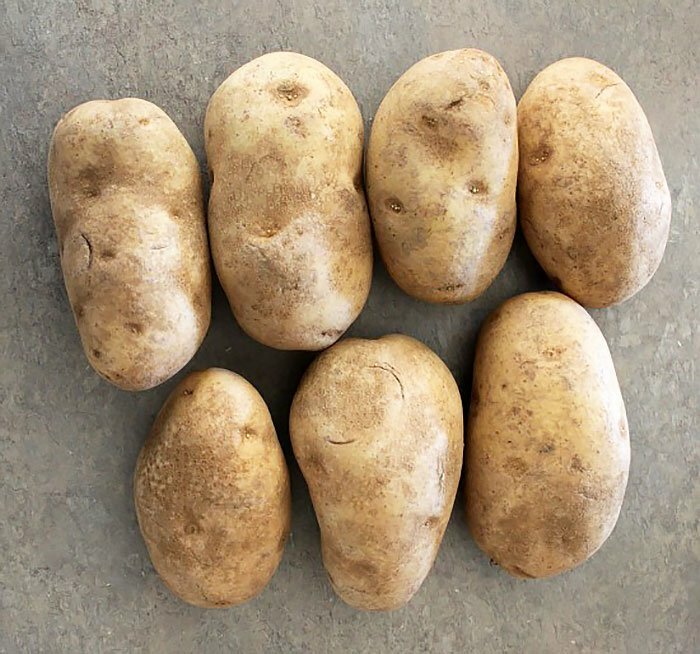 Peel your potatoes and cut them into medium sized cubes (about a half-inch to an inch in size). 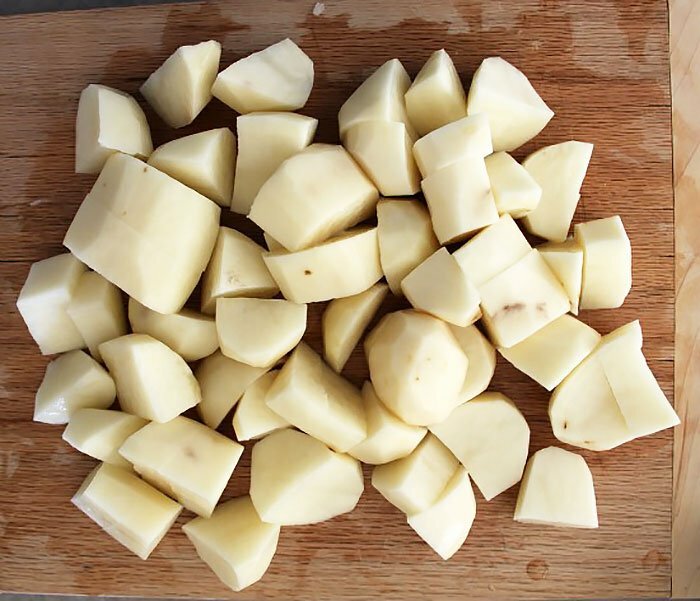 Fill a pot with water and boil your potato cubes until they are very soft. Drain the water off your potatoes. Add in your butter, sour cream, and milk. Whip them until they are creamy. Using a mixer will make this step a lot easier. Once they are good and fluffy, add a little salt and pepper and they are good to go. 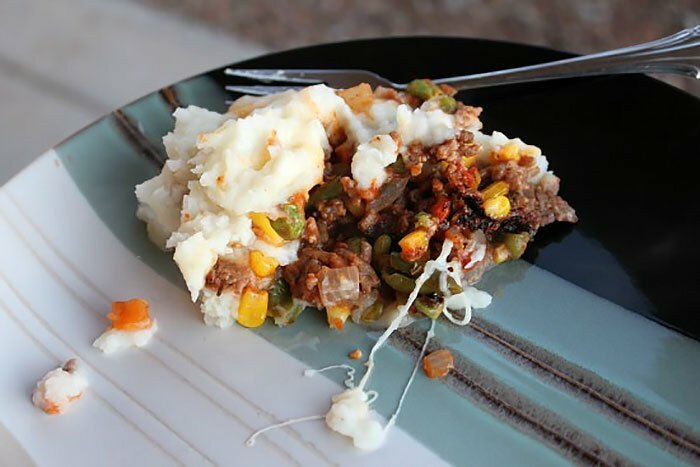 The filling for a Shepherd’s Pie is simply meat and vegetables. You’re free to change this up with any sort of ground meat or vegetables you like (or no vegetables at all). 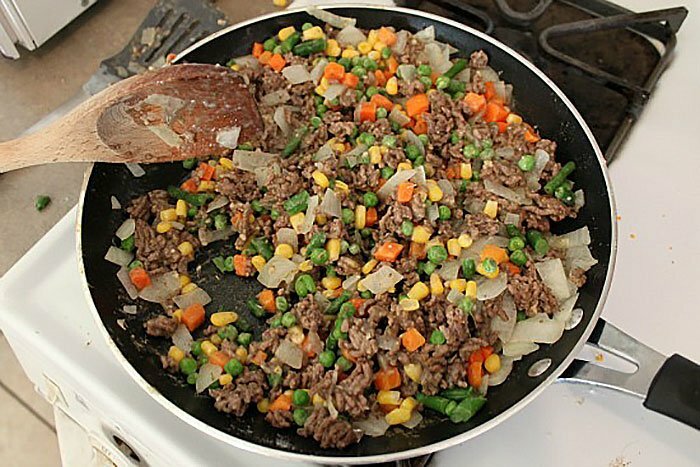 For this recipe we’re just doing the basics of ground beef, corn, peas, carrots and green beans (you can find the veggies for this pre-mixed on the frozen aisle). 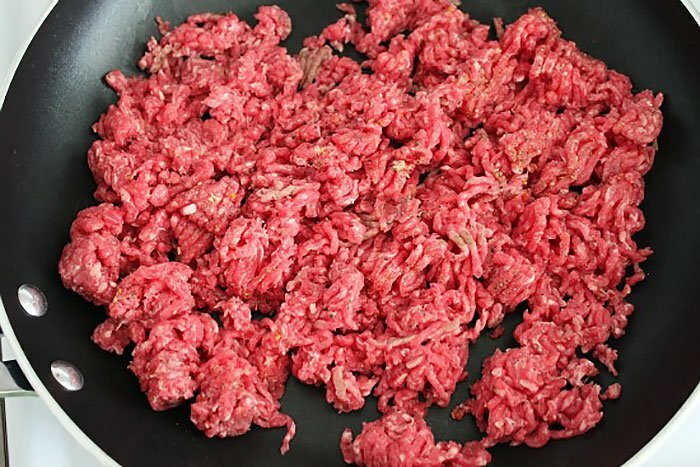 Thoroughly brown your ground meat in a large skillet. Be sure your skillet is big enough to both brown your meat and add your vegetables later. While your meat is browning, dice up your onion. Add to your meat once it is brown, then cook for two or three minutes or until the onions are translucent. Now, add your flour. Try to get everything coated as much as possible. It can help to sprinkle a little, then stir, then sprinkle some more, until its all mixed in. Throwing it all in at once will make it more difficult due to clumping. Add your garlic, chicken broth, tomato paste, and seasonings. Bring to a boil and cook until the mixture thickens. Mix in your frozen vegetables and cook for about five minutes (or until the vegetables are crisp, but not soggy). 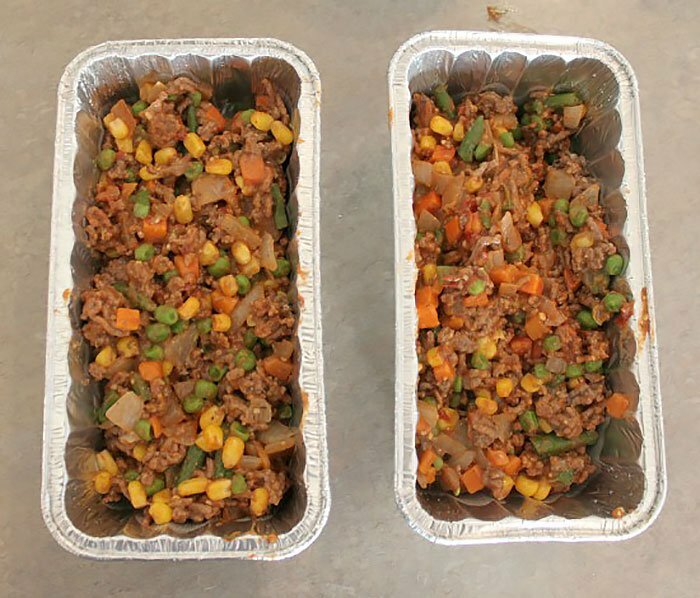 Fill your tin foil containers about halfway with the meat mixture. Make sure its as level as possible. 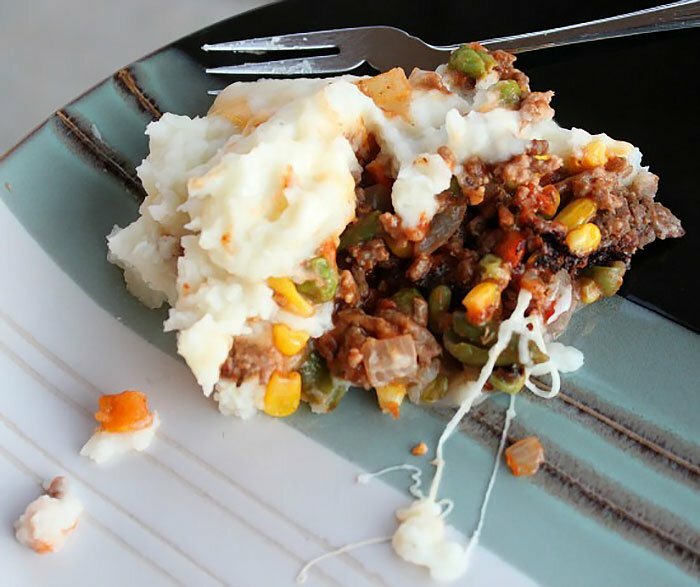 Spread your mashed potatoes on top of the meat filling, being careful to not to disturb the meat too much. You want to keep your layers intact. Sprinkle some of your cheese on top. 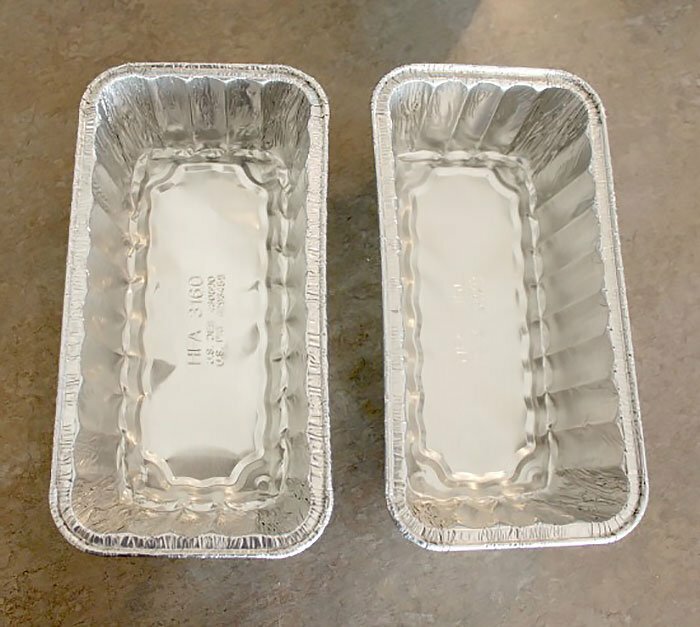 Cover each container with the heavy duty foil. Be careful to press the sides down firmly so that nothing leaks out. 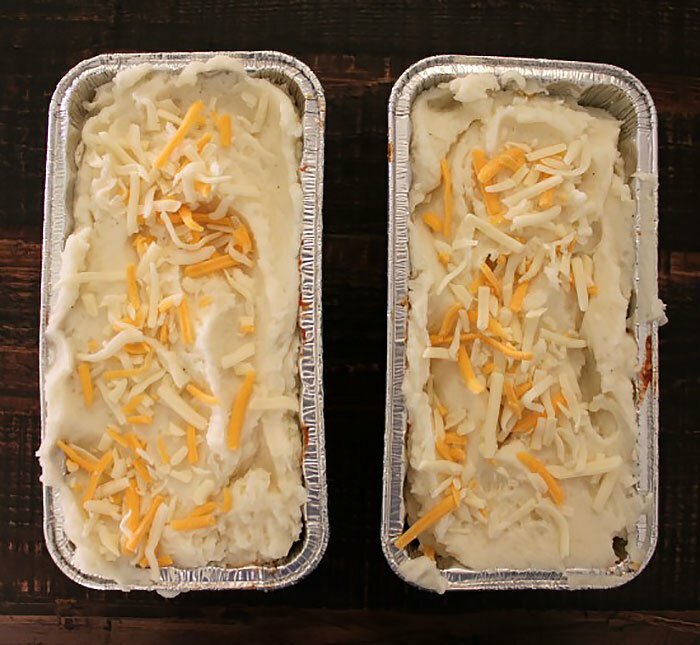 Refrigerate overnight so that all of the ingredients can firm up for your trip. You can also freeze them for easier packing. If you do, you’ll need a couple of hours (at least) at the campsite to thaw them out. They need to be completely thawed before you start cooking. Try setting them near your fire (not close enough to cook) to help speed up thawing. When you put your containers in your cooler for your trip, be sure you don’t stack anything on top. 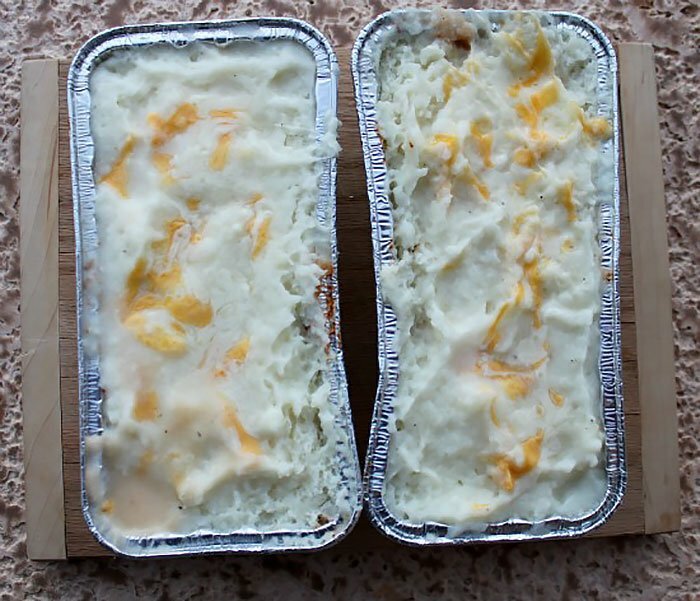 Once you’re at your campsite, get your shepherd’s pie out to thaw a few hours before you’re ready to start cooking (if you froze them for the trip). Once you’re ready to start cooking and you’ve got a good bed of coals in your campfire, just put your tins right on top of your coals. Let it cook for about thirty minutes. About five minutes to the end of your cook time, you can throw a few coals on top to help melt the cheese and get your potatoes good and hot. It may take a little longer than thirty minutes depending on how hot your coals are and how cold your shepherd’s pie was. Just take it off with some tongs to check. If its not heated all the way through, just toss it back on the coals for another 5 – 20 minutes to finish cooking. That’s it. Carefully remove the tinfoil cover (careful, the steam can burn your fingers) and dig in. We know this recipe isn’t typical campsite fare, but we love how easy it is to cook once you’re at the campsite. Its also very satisfying after a day outdoors. 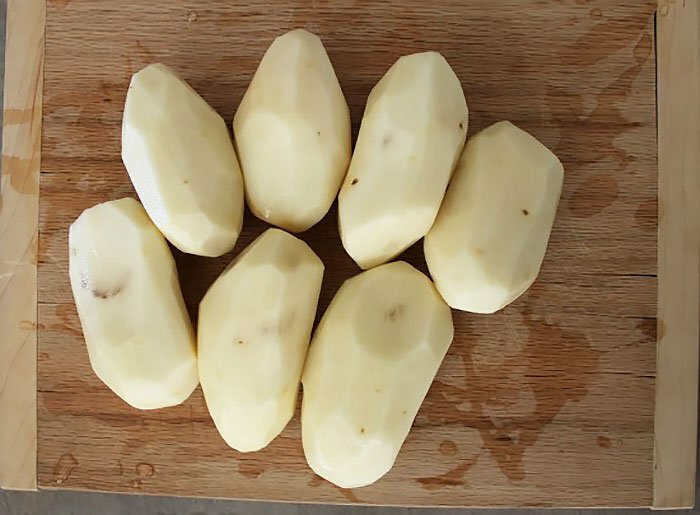 Peel your potatoes and cut into 1/2 to 1 inch cubes. 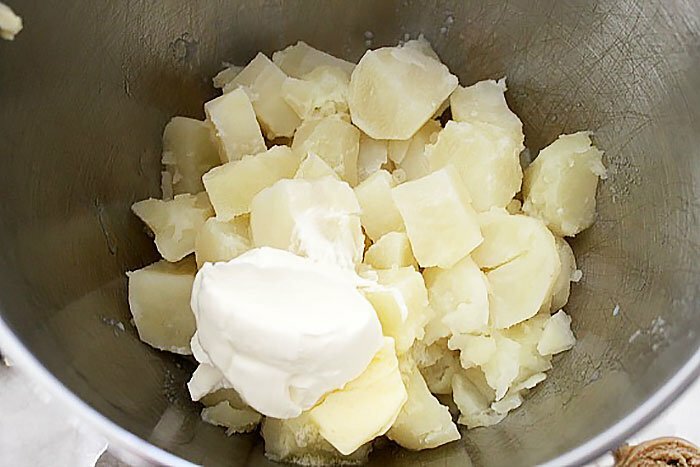 Boil potato cubes until very soft. Add butter, sour cream, and milk. Whip until creamy. Add salt and pepper. 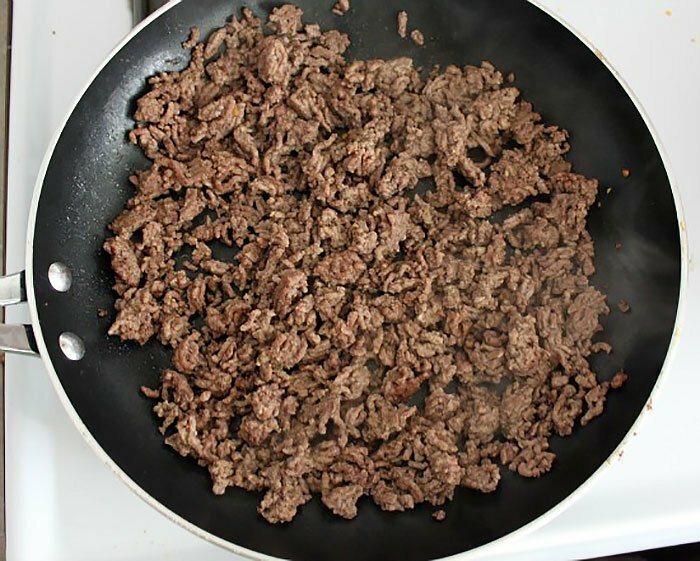 Thoroughly brown meat in a large skillet. Dice onion and add to browned meat. Cook 2-3 minutes, or until onions are translucent. Add flour and stir to coat evenly. Add garlic, chicken broth, tomato paste, rosemary, and thyme. 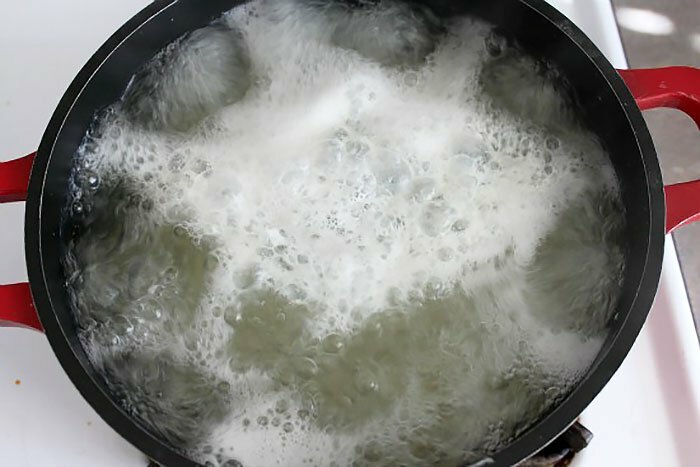 Bring to a boil until mixture thickens. Mix in frozen vegetable and cook for about five minutes (or until the vegetables are crisp, but not soggy). Fill your tinfoil container about halfway with meat mixture. Add mashed potatoes, being careful not to disturb the meat mixture too much. Cover with heavy duty foil and crimp the sides tightly. 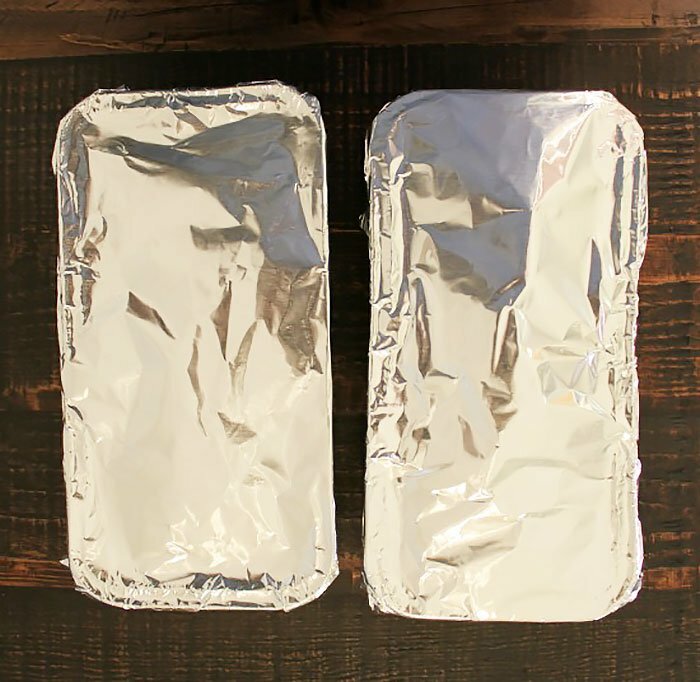 Place tin foil containers directly on bed of hot coals and cook for about thirty minutes. About five minutes before your shepherd's pie is cooked, put hot coals on top. Take off and check that everything is hot. Cook for another 5 - 20 minutes, if needed.